THE BRILLUSTRATOR: Usagi Yojimbo Fan Piece! A fairly tight pencil drawing painted in Photoshop. I did this to submit to the San Diego ComiCon Souvenir Book. The kanji in the background says "25" representing Stan Sakai's 25th anniversary publishing Usagi! 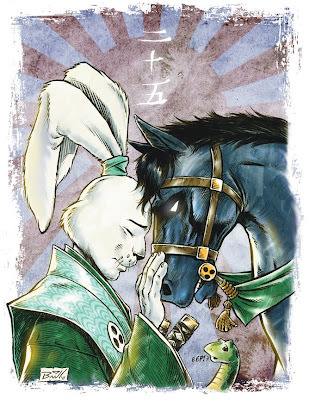 The dark horse he is patting represents...well Dark Horse Comics, his current publisher. I don't know if it will be used or not, but I enjoyed making it and it came out pretty well, so I'm happy. Fantastic piece of fan art! If I may suggest, instead of submitting this to the SDCC Souvenir Book, which celebrated Usagi Yojimbo's 25th anniversary a couple years ago, and since the recent issue of Usagi Yojimbo with the alternate cover featuring the big 25 on it was celebrating Dark Horse Comics 25th anniversary, maybe you could submit it to Stan Sakai @ Dark Horse Comics for possible publication in the letter pages or on the back cover of an upcoming issue of Usagi Yojimbo. Sadly, not a lot of fans still submit letters to their favorite comics anymore. Thank you--I will try that!